Real estate sign toppers allow you to extend the real estate on your frame or A frame and easily slide in different riders for changing the message. Our custom sign riders come in black or white and accommodate different sizes. 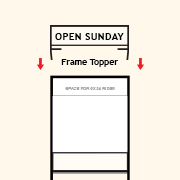 Add a rider space above your A-frames. No hardware needed! 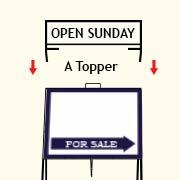 Add a rider space above your 3/4" angle yard signs. No hardware needed!